Digital editing can sometimes reveal structures that are otherwise difficult to see. Connecting a digital Single Lens Reflex (SLR) camera to a microscope has several advantages over dedicated microscope cameras. 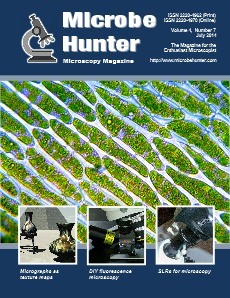 By using a flashlight with an UV LED, it is possible to do basic fluorescence microscopy. The testate amoebae Arcella dentata has several “teeth” (hence the name) giving it a star-like appearance. Why not use micrographs as surface texture for 3D mapping? Here are some suggestions on what you can do!